As Bucs players sat in the locker room during halftime Sunday, it was so quiet, you could hear a head drop. Coaches huddled in disbelief over stat sheets that reflected just how soundly the team had been beaten in every phase of the game by the Vikings; most notably on the scoreboard, where Minnesota held a commanding 17-0 lead. "It was real quiet in here. Then I started chattering a little," left tackle Donald Penn said. "The other guys started, too. 'This isn't okay! This isn't Buc football!' "
Coach Raheem Morris walked past the offense and lit into his defense, made one lineup change, then turned the game over to Captain Comeback. Josh Freeman, who has a history of late-game dramatics, passed for 191 of his 243 yards and a touchdown during the second half, helping set up LeGarrette Blount's winning 4-yard scoring run with 31 seconds remaining as the Bucs rallied for a 24-20 win. Eight of Freeman's 14 career victories have come when the Bucs (1-1) took the lead in the fourth quarter or overtime, the most in league history of any quarterback after 27 starts. Considering Tampa Bay was outgained 284-62 in the first half, Sunday's turnaround might have been Freeman's best. "It's No. 1 right now," Morris said. "It's the last one and the best one you can possibly get in Freeman's career — today." The Bucs have started slowly in both games this season. But the Vikings (0-2) can't finish. For the second straight week they blew a halftime lead of 10 or more points and have been outscored 41-3 in the third and fourth quarters. With the victory, the Bucs kept pace in the NFC South with the Saints (1-1) and Falcons (1-1) and avoided joining Carolina (0-2) in the cellar. 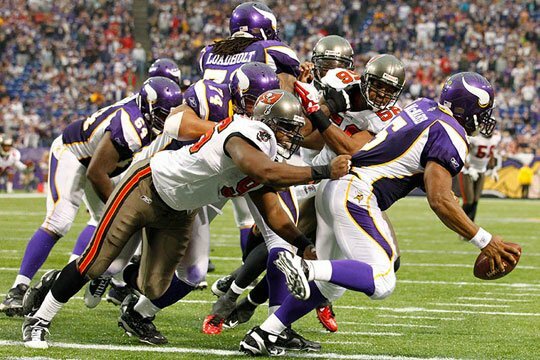 "(Zero) and two is not dead," Bucs cornerback Ronde Barber said. "We've seen 0-2 teams make runs. But just from a psychological standpoint, 1-1 is a whole lot better on your scorecard, especially when you're on top of your division again. "That was one of Rah's biggest messages (last) week. Win this game and stay in front in the South. That's going to be his message all year." Morris said he didn't make many halftime adjustments. Quite the contrary. Aside from benching linebacker Quincy Black, who struggled with an ankle injury and to corral All-Pro running back Adrian Peterson (120 yards, two touchdowns), Morris stuck with the game plan. A week ago, trailing the Lions by only a touchdown at halftime, Morris pulled the plug on Blount and went to a two-minute offense. On Sunday, Blount had only 4 yards on five carries in the first half, but he erupted for a 27-yard touchdown the first time he touched the ball in the third quarter. Blount finished with 71 yards and two touchdowns on 13 carries. Morris had said he believed his team "blinked" against the Lions in the opener, and he reminded them of that at halftime. "He had some profane stuff in there," Barber said. "It was, 'We are going to do this and this different, and we're going to win this football game.' He must have said 'win' 20 times in his halftime speech. That's exactly what we went out and tried to do. He has his moments where he can get emphatic. I think guys respond to that." Especially Freeman, who passed for only 52 yards in the first half. It's not as if Freeman was perfect during the second half. He was intercepted in the end zone after Morris called for (and the Bucs executed) an onside kick following their first touchdown. But Freeman got a big lift from Blount and Preston Parker, who had six catches for a career-high 98 yards. Meanwhile, the Bucs defense bottled up Peterson in the second half, limiting him to 37 yards. "He tackled me a couple times," Barber said. Freeman has already proved he saves his best for last. In the fourth quarter this season he's 26-for-37 for 260 yards and two touchdowns for a 107.9 passer rating. His eighth come-from-behind victory eclipsed the Colts' Peyton Manning, who had seven among his first 31 starts. After the game, before stepping to a bank of microphones adjacent to the locker room, Freeman wiped his face with a towel one last time. But fourth-quarter comebacks seem like no sweat at all for the 23-year-old. "I just try to win. That's all there is to it," Freeman said. "It's as simple as it goes. "When we got the ball back with (4:12) to go, what was going on in my mind was I knew we were going to score. I wanted to score and not leave (Vikings quarterback) Donovan McNabb enough time to come back and retaliate. It worked out great."